Fully Furnished Meritage built Yukon home with 4' Garage Extension! This Gorgeous kitchen Includes a plethora of Cabinets, Granite Countertops, Stainless Steel Appliances, (range is pre-plumbed for gas), and oversized Kitchen Island. Fall in love with the majestic master suite which offers walk-in closet and gorgeous bath with dual sinks and walk in shower. 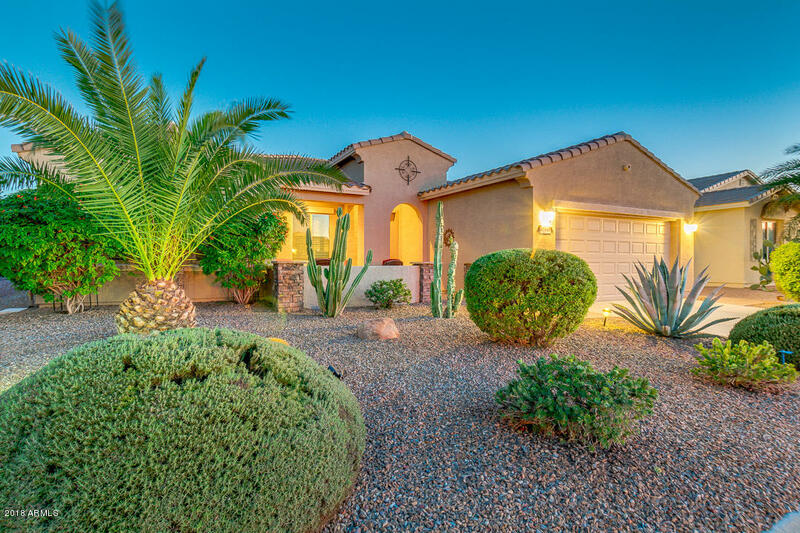 Your Resort style Backyard is just another living space to enjoy the fabulous Arizona weather while having a BBQ with your Gas plumbed grill while sitting under your extended covered patio and putting on your very own putting green. This south backyard gives you the warmth of the winter sun while you have a courtyard in front to socialize with your friends and neighbors too! Furniture is available on a private bill of sale. See the documents tab for floor plan and a list of furniture. - All irrigation both front and back has been replaced with PVC from builder standard irrigation. Front and Backyard landscaping was all professionally done including pergola and front courtyard for over $30,000 after COE. Many furnishings in the home were purchased at Thomasville (high end furniture). Please note the home is a 2nd home (taxes are higher than if this were a primary home) and homeowners spend approximately 5 months a year in the home. FIRPTA does apply.